Now that the Galaxy S10, S10+, and S10e are up for pre-order and (almost) ready to ship to their earliest adopters, it's time... to get excited about the Galaxy Note 10. While it might be way too soon to know for sure how many cameras Samsung intends to slap on the back of its next S Pen-wielding flagship, the company seems to have already revealed a key selling point and breathtaking feature set to blow the Galaxy S10 family out of the water. Remember that 1TB memory chip Samsung just unveiled last month for apparent use on the Galaxy S10+ Performance Edition? Believe it or not, the company is today announcing something even more impressive that's likely to make a commercial debut inside the Galaxy Fold. Meet the industry's first 512GB embedded Universal Flash Storage (eUFS) 3.0 solution for "next-generation mobile devices." While this thing obviously can't compete with the "industry's first" 1TB eUFS chip in terms of digital hoarding room provided to end users, that bad boy Samsung announced in January is actually powered by older eUFS 2.1 technology. The hot new eUFS 3.0 standard will allow the Galaxy Note 10 and, possibly, the Galaxy Fold to achieve sequential read speeds of 2100MB/s, up from 1000MB/s on the 1TB variant of the Galaxy S10+ and 860MB/s on 512 gig models. Those are naturally maximum theoretical rates, but you can be certain you'll notice a big difference out in the real world as well. Actual Note 10 storage may not be twice as fast as the Galaxy S10's ability to accumulate or transfer stuff in all scenarios, but it will be considerably speedier most of the time. At least in theory, Samsung says the groundbreaking new technology should enable the "premium" smartphones of tomorrow to transfer a Full HD movie to a PC in "about three seconds", which is absolutely mind-blowing. 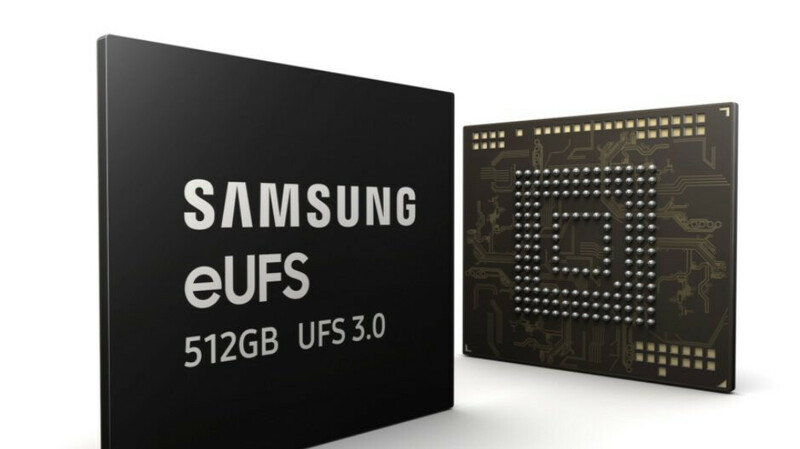 512GB eUFS 3.0 mass production is already underway, with both 1TB and 256GB models expected to launch sometime "in the second half of the year." Presumably, in time for the Galaxy Note 10, which means there could be as many as three versions of Samsung's next big thing featuring this Universal Flash Storage 3.0 solution. Of course, the company also plans to help other "global device manufacturers in better delivering tomorrow's mobile innovations." That might be one of the reasons why this tech giant is the world's largest chipmaker in addition to the number one smartphone vendor out there. Samsung nailed it this year. Note 10 will have the same memory. Not possible to have the new one. Possible is for some new folld devices. S Fold, Note Fold or A fold. More reasons to buy a Note this year. People don't realize this, but the RAM and storage speeds are more important than the SoC itself in terms of the performance in most modern day regular use-cases. Apps and games load quicker, the phone boots faster, you can record higher framerate video for longer durations, and in general less hiccups with vast amount of bandwidth. The note 10, if it comes with Exynos 9825 (7nm EUV), LPDDR5 and UFS 3.0 will be a killer offering, since the s10 is pretty much perfect otherwise. yeah thats why apple iphone was faster than high end androids, now iphones are only faster in video editing.. and android will leapfrog it with UFS 3.
mSD died years ago; some users have yet to find out.